Though there are lots of farmers being in debt and other challanges.It is all because of lack of awareness and group farming is found only in very few places. Resp Sowmya madam, I appreciate your thought about group farming. I doubt, about its success, in India. in Israel, in agriculture, group farming is around 50 % and is running successfully, in the name KIBUTZ ;s. They are concentrating only on agriculture and without any POLITICS,CASTISM and GROUPISM. In our India, only the above plays a vital role, rather than agriculture. Israel is now, experts in not only chemical farming but recently they become world leaders in ORGANIC PRODUCE also. I have my own doubts about the group farming in our India, even in nearby future also. Think twice, of my statement with broad thinking. In old USSR, socialism and communism did not come just like that and it came only after a blood revolution during 1930"s. In our mind also only development , growth should come which should superseed politics, castism, groupism etc. Dear Sri Pvrao, welcome to our forum. Gerbera has become like an organised sector. Since it is easy to grow and as the plants availability is good and also as the Gerbera plants suppliers are giving good after sales service and technical helps, most of the Greenhouse farmers are inclained towards Gerbera farming. It is a fact that gerbera flowers prices are very fluctuating and also basing on the city/Towns. Study the markets for atleast from couple of years and come to a conclusion. In general Gerbera flower farming is good in terms of reasonable margins, but based on time mostly. Here is rough economic guidelines before you venture into this. One acre of polyhouse can accommodate about 24000 plants, you can expect average yield of 10% of the total plants, i.e., 2400 flowers/day for 365 days. Average flower price you can take it as Rs.3/flower through out the year. If you sell directly in the market you will be able to get still better price. The prices may vary for first and subsequent years (reducing). The life of plants is about 3 years. Expense (labour & chemical/fertiliser) depends upon your management, it can be anywhere 35% ~ 50% of your revenue. This is not including bed preparation and other initial expenses. Hope this should be of little help. I am planning for acre… my market place is about 200kms…how I need plan pluking the flower, because I can not send every day to market as it is far… should I need to plane twice in a week? I mean once we cut the flower, how many hours or days I can restore in water… if I plan to send once 3 days, how the pluking of flowers schedule should be? if I keep the one or two days on tree…is it fine? will it have any effect on another flower of same plant? I hope you understood my question? I know few small time growers around Bangalore will pluck flowers once in 2 or 3 days and take it to market. You can also do it depending upon your local market demand and supply. For one acre, the ideal will be alternate days plucking and also depending upon the market demand. Is any one practicing rainwater restoration and using for irrigation in poly house farming, especially in gerbera…? Is rainwater good for gerbera farming? I mean EC and PH levels makes any problem? Dear Sri Pvrao, Rain water is the best water for agriculture. It will have a very low EC count ( with negligible salts/minerals ) and normal PH. Calculation for rain water collection from 1 acre green house. 1 acre green house means 4,000 sq.mtrs x your rain fall ie; 900 mm ( 0.9 mtr )= 3,600 cubic mtrs. One cubic mtr area will have 1,000 ltrs of water x 3,600 cubic mtrs = 36,00,000 Ltrs water per anum. Water Storing system : From green house gutters, give connection to a reservoir pond of size 20 mtr x 40 mtr ( 8 guntas / 20 cents / ie; 1/5 acre ) x a depth of 4.5 mtrs ,can store 36,00,000 ltrs rain water. Dig a pond of size 20 mtrs x 40 mtrs, and give lining with 500 microns poly flm or 1000 microns poly film ( 1 mm thick film ), and cover the top with 90 %/ 75 % shade net of black or green colour, to educe evoporation loss and for protection of water from fungal/algae damage. This water is sufficient for any crop in 1 acre in green house comfortbly, including gerbera. Dear Sri Pvrao, as regards to gerbera project report, you may contact experts issuing project reports for farming gerbera, in which they give statements of not only the amount required for farming and also loan amount required, income sheets and the repayment schedule etc. totalling to Rs 44 .0 lakhs. Yields starts after 3 months. I feel the calculations should be further fine tuned. In my area ( close to Hindupur, Andhra Pradesh) the total rainfall is around varies between 350-600mm per anum (guesstimates If anyone knows where to collect authentic data please do PM me) . In reality, all rainfall does not result in run off. You need more data on the rainfall distribution. here is what i estimate happens for me. Rainfall days are around 60 days in an year. Out of the 60 days I do not think run off happens on more than 15 days in an year. The run off kind of rain happens in 3 seasons. April-May , Jun-Oct , Dec-Jan. As such I would not plan on a harvesting structure for more then 150 mm catchment in my area. Would never fill up and be a wasted expenditure. Down size the pond and spend more on a pucca drainage system that picks up every single drop of run off… Also, go for a deeper pond and either cover it or try to place it in a shade. Losses due to evaporation can be huge. It is good to know that more peoples from IT interested in farming, my self programmer have my own it software development house in Dubi, right now i am India working for a project to setup a very unique idea in farming my plan is to setup yards for at least 12 types of activities in each yard of every village in India… further you can get idea in ads section of this site or you can visit qualityfarms dot net for more information. The information I provided was based on my experience with my farm in madaksira, Anantapur district. It is related purely to how one should calculate available water. I do not have a poly house. Also, in my case as a small streamlet ( Vanka ) runs through my land, i get the benefit of getting run of from, my guess around 20 acres of land upstream to me. Here is a rainfall distribution map I picked up for anantapur. 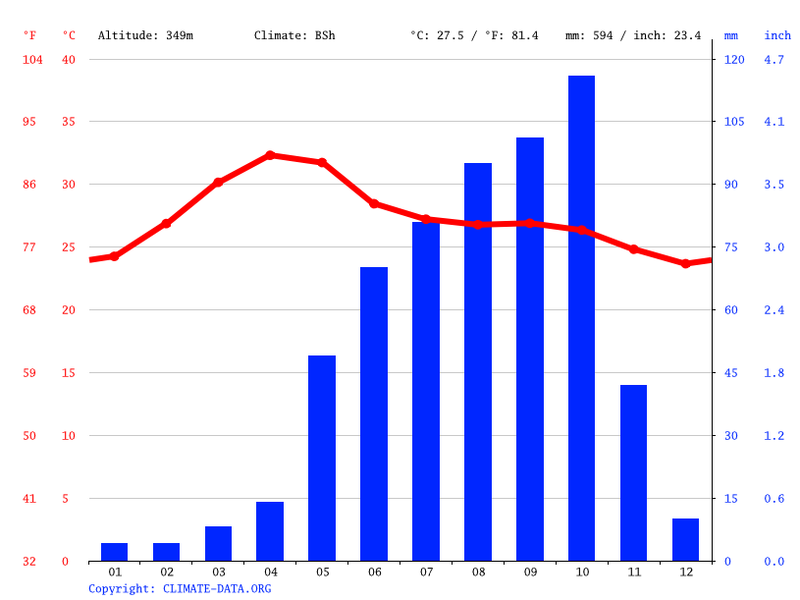 As you can see the total rainfall is 526 mm, but the peak monthly rainfall is around 130mm in the month of november. Now if the 130 mm happened evenly over the whole month then the daily rainfall would be only around 4mm. This would not result in any water flowing over the land. Rainfall at a rate greater then the percolation rate ONLY will result in flowing water that can be chanelled to a storage reservoir. If the land is dry then even a 10 mm rain may not result in any appreciable water collection. For example what this chart does not tell you- The rain in April - May happens in at least one big burst of over 40mm resulting in a huge run off in spite of the fact that the land is at its driest point over the whole year. Based on the graph attached I would plan only for a storage reservoir to collect 130 mm using the formulas you have given. Hope that clarifies what i am trying to convey. Dear Sri J.Ramesh , I am in total confusion. I feel that the caliculations i gave are correct in practice. From a green house, rain fall water can be taken/collected in total. Sri PVRAO stated that his rainfall is 900 mm to 1000mm and he asked the forum to give caliculation for water harvest from a green house per acre. Basing on this, i took his rainfall as 900 mm ( 0.9 mtr per year ) and on caliculation i have finished the result as 36,00,000 ltrs per year, from 1 acre green house. Pl specify if i am wrong in my caliculation, as stated by you on 28.10.2015, and if so i will rectify my self. Ofcourse, i am very sure that my caliculation is right. Several times, i have harvested my green houses rain water and collected rain water as stated in my answer dtd 22.10.2015. When i suggest our forum members, i do only with my experiance only as it should be helpfull to our forum friends. Any how, weighting for your reply. Dear Sri Pvrao, Is it marigold, a popular variety of Chrysanthemum/Chamanthi or Bhanthi/Chendu farming. Pl clarrify. I am asking details for Banthi. thanking you.